Check with your vet. 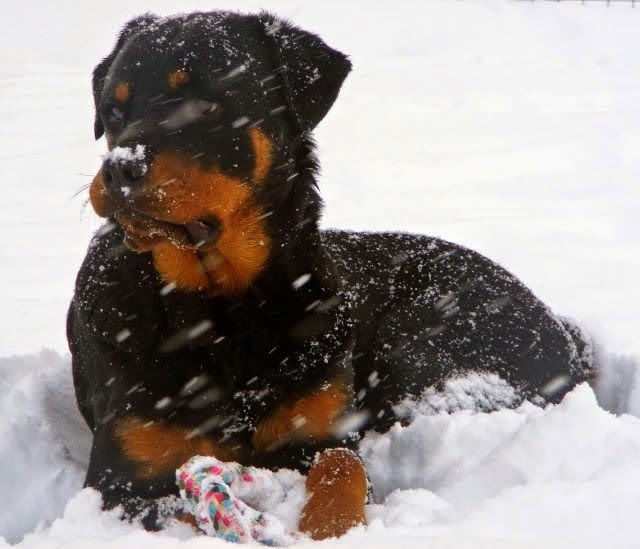 Senior dogs, dogs with arthritis and puppies can be very sensitive to the cold weather. Ask your vet when is the perfect time to walk your dog and if it is okay to walk him. Stick to fenced dog parks. More dogs are lost during the winter than any other season, possibly because dogs can lose your scent in snow or ice and become lost if they can’t see you. Trim your dog’s paws. If your dog has furry feet, ask your groomer to “scoop” the pads — trim the hair that grows between your dog’s toes and under his feet — during the winter to prevent ice buildup between the paw pads. Play fetch with toys, not sticks. Sticks — so plentiful in winter — can cause choking and severe injuries. I will say it again too. #4 is very, very wrong thing to do! Why do you think it grows in the first place?! The fur is there for a reason - to protect your dogs paws! #5 is true during the whole year, because the wood pieces are sharp and can hurt the dog's stomach, not only during the winter. Our girl lives inside with us. We have a huge yard. Fenced of course for her protection. She likes to come sit on the front porch and just chill. We let her stay out until she wants to come in. I have CCTV installed so I see every where she is.